The four Scooter novels: Front jackets of the first hardcover editions of Train Whistle Guitar (1974), The Spyglass Tree (1991), The Seven League Boots (1996), and The Magic Keys (2005). Albert Murray was born 102 years ago tomorrow (May 12); he died just five years ago at the age of 97. In the 1970s Murray rose to fame as an essayist and a jazz critic, publishing such well-received—and still influential—books as The Omni-Americans and Stomping the Blues. He also published a series of four novels following a young man named Scooter from his childhood home outside Mobile through his days as a college student, a jazz musician, and finally a writer. The novels were written and published over a period of six decades—from the 1940s until 2005, when The Magic Keys appeared. After he finished the final novel Murray planned to work on a spin-off of sorts, returning back in time and focusing on Scooter’s family and neighbors in Alabama. But the 89-year-old suffered from a series of health problems that kept him from writing. Although Murray lived for another eight years, only a small scene from the novel was completed—and this fragment, “Manifest Destiny U.S.A.,” was published for the first time in the newly released Library of America volume collecting all four of the Scooter novels. 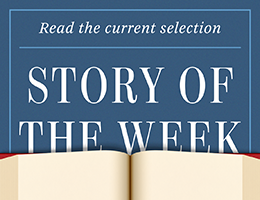 We present the selection, free, at our Story of the Week website.